Chemical peeling refers to the application of a chemical agent to cause selective injury (necrosis) to the epidermis and upper dermis with the aim of rejuvenating the skin. Based on the depth of the skin injury, chemical peels are categorized as superficial (epidermal), medium (epidermal/dermal) or deep (deep papillary, papillary/reticular). 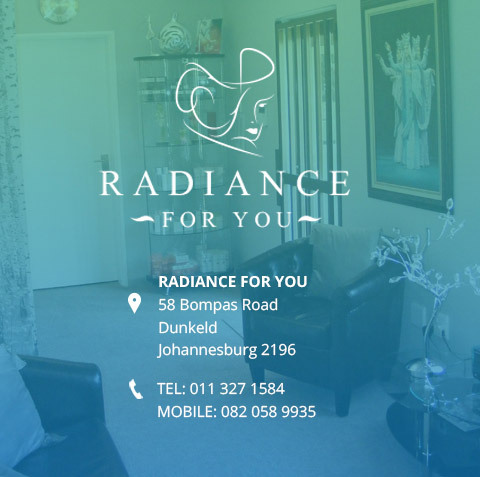 At Radiance for You we mostly perform superficial chemical peels and these are described in more details below. Superficial Peels have become one of the most popular cosmetic and anti-ageing procedures worldwide. Superficial peels induce necrosis and subsequent removal of only the outer layers of the epidermis. Amongst the most widely used chemical peeling agents is glycolic acid, which is extracted from sugar cane and belongs to AHA (alpha-hydroxy acid) fruit acids. Glycolic acid is a medical grade product and it is highly effective as an exfoliant. The depth of exfoliation/peeling may vary depending on the pH and concentration of the glycolic acid used. Glycolic acid peeling removes an outer layer of epidermis (stratum corneum that consists of “dead skin cells’) yielding skin that is smoother in texture and more evenly pigmented. Since the start of the use of chemical peels in medical aesthetics, it has been demonstrated in clinical studies that application of AHA’s results in an up to 25% increase in skin thickness, improved quality of elastic fibres and increased density of collagen. Glycolic acid is also a good moisturising agent that increases hydration of the skin. Many popular chemical peeling kits (e.g. NeoStrata, Filorga) contain additional active ingredients to assist in treatment of hyperpigmentation and acne. Usually the peeling procedure takes approximately 30 minutes and it is performed in a few steps: cleansing of the skin, pre-peeling treatment, peeling and finally post peeling treatment (i.e. neutralisation of glycolic acid and hydration). During the peeling procedure you may experience mild stinging, burning or itching of the skin. This mild discomfort usually disappears during the post peeling step. Similarly to microdermabrasion (non-chemical exfoliation) visible improvement in skin texture and complexion can be appreciated immediately after the first peel. However, to obtain more radical and a long term improvement a series of chemical peels are recommended followed by maintenance treatments over time. Chemical peels may be performed on the face, neck, décolleté and other parts of the body. It is beneficial for both female and male clients, from the age of 16 years and older, and may be applied to all skin types (including Asian and African skins). WHAT CAN BE TREATED WITH SUPERFICIAL CHEMICAL PEELS? Most individuals require 3 to 5 treatments, after which a maintenance program can be established. A series of chemical peels will result in the thickening of the epidermis (the outer skin layer), which will provide the skin with better hydration levels and long term anti-ageing protection. Depending on severity of the skin problem(s) and the area being treated peels can be performed every 2 to 4 weeks, with maintenance peels being performed as required. WHAT HAPPENS AFTER EACH CHEMICAL PEEL TREATMENT? Superficial glycolic peel is “the lunchtime treatment”. The procedure takes only 30 to 40 minutes and requires no recovery time, i.e. a client can return to work immediately after the treatment. Some patients may have mild temporary redness, which subsides within 10 to 30 minutes. As mentioned above, an improvement in skin texture and complexion is noticeable immediately after each peel.